DiskSorter Server provides a variety of configuration options allowing one to easily integrate the product into a user-specific network environment. In order to open the main settings page, click on the 'Settings' link located on the top menu bar. The DiskSorter Server web-based management console, requires users to login with a DiskSorter user name and password. The default user name and password is set to admin/admin. In addition, DiskSorter Server provides the ability to set a custom user name and/or password for the DiskSorter web-based management interface and the command line utility, which may be used to automate configuration and management tasks. 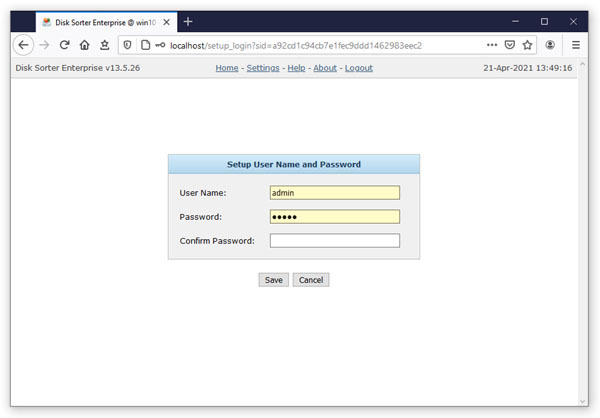 In order to set a custom user name and password, click on the 'Configure Server Login' link located on the main settings page, enter a new user name and password and press the 'Save' button. DiskSorter Server uses the TCP/IP port 9125 as the default server control port and the TCP/IP port 80 as the default web access port. Sometimes, these ports may be in use by some other software products or system services. 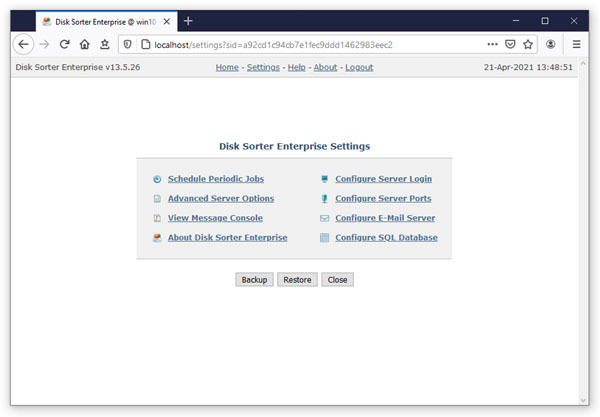 If one or both of these ports are in use, DiskSorter Server will be unable to operate properly and the user needs to change the DiskSorter server control port and/or web access port. In order to set a custom server control port and/or web access port, click on the 'Setup Server Ports' link located on the main settings page, select the 'Use Custom Port' option and enter a custom port number to use. If the DiskSorter server should be controlled through the network, make sure the custom ports are open in the server's firewall. DiskSorter Server provides the ability to send E-Mail notifications when a user-specified disk space analysis rule is triggered for one or more disks or directories. 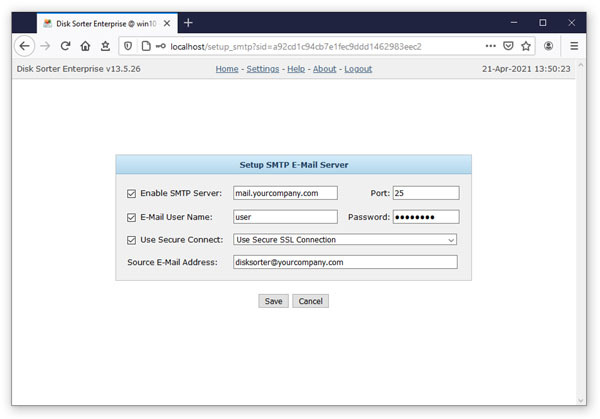 In order to configure an SMTP E-Mail server to use to send E-Mail notifications, click on the 'Configure E-Mail Server' link located on the main settings page, enter the SMTP server host name, SMTP server port, SMTP user name, password and the source E-Mail address to use to send E-Mail notifications. 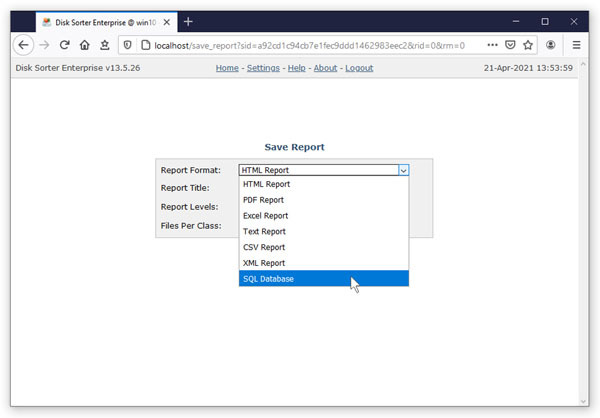 DiskSorter Server provides the ability to save file classification reports to an SQL database allowing one to keep a history of reports for future review and analysis. In order to enable SQL database export, open the file classification command, press the 'Options' button, select the 'Always Save' checkbox, select the SQL database report format and press the 'Save' button. DiskSorter Server exports SQL database reports through the ODBC database interface, which should be configured to operate properly. 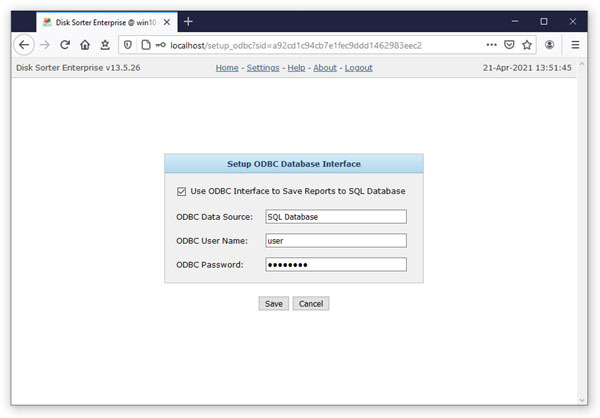 In order to configure the ODBC database interface, click on the 'Configure SQL Database' link located on the main settings page, enable the ODBC database interface, specify the ODBC data source, ODBC user name and password to use to save reports to the SQL database.